Why Is Travel Good for Kids? Traveling after children will never be the same as traveling before children. My previous vacations of cocktails and little black dresses turned into days filled with diapers and sippy cups. It can be a bit hard adjusting to this change, but after it definitely gets better as my kids get older, and I wouldn't trade it for anything! Do you like traveling with your kids? My husband and I have been away for one weekend by ourselves, but other than that, all of our vacations have included our children. No matter how crasy it can get, it truly wouldn't feel the same without them. Family travel enables you to make memories that will last a lifetime. When I was younger, my parents took my sisters and I on long car rides all over the Eastern U.S. We went to more museums, exhibits, festivals, and different cities than I can count. I really think it helped me have an appreciation for art and culture. Even though I may not remember every little detail of each adventure we went on, these memories are part of who I am today. I believe that travel is so important for children's development. When you're traveling as a family, you learn things that you couldn't learn from a book. You get to use all of your senses to explore a new environment. Kids learn about different ways of life, grow their communication skills, and experience things they never even dreamed about. Plus, getting to see things from your children's perspective, for the first time, is a priceless experience. In the past, I've written a bunch of articles about family travel and I wanted to share some of them with you. 6) 10 Disney Tips on Everything from Toy Story Mania, Epcot, PhotoPass & More! Why do YOU think travel is good for kids? Where is the coolest place you have taken your kids? Do you have any favorite memories from your childhood? 1) Avoid the crowds - If you're planning field trips, "plan them for later in the afternoon when attractions are less likely to be crowded" says Jennifer of Jersey Family Fun. 2) Just Relax - Jessica, of DelcopaMoms says "I don't know about everyone else's families but mine runs from soccer to t-ball to gymnastics and back again. One week this spring, the kids don't have activities, we're vegging out! We have one planned activity the entire week. I also plan to hang, watch tv, probably do a TON of coloring but we're relaxing!" I want to introduce you to my new local love: Longwood Gardens, in Kennett Square, PA. It's a magical place you can go again and again, and have a different experience each time. That's what I love so much about local parks, gardens and arboretums. They are constantly transforming from season to season, and there are always new surprises with each visit. 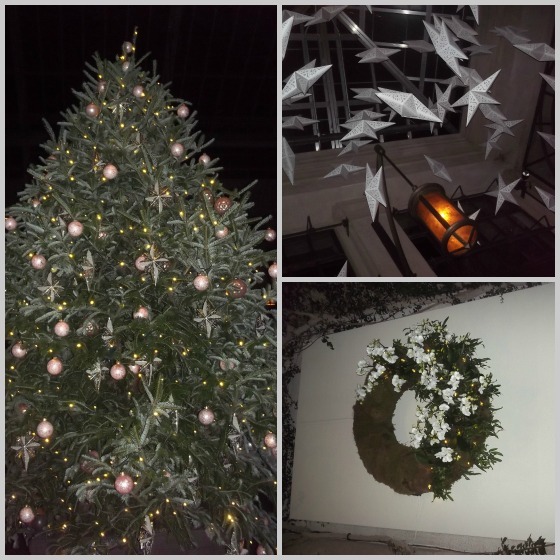 My family first visited Longwood Gardens during Christmas time about 5 years ago when we had family visiting from out-of-town. People flock to Longwood each year around the holidays because of the spectacular holiday lights, flowers, trees and decorations throughout the grounds. More than 16,000 plants, over 500,000 Christmas lights, and over 1,600 starry ornaments are used for this year's display. It really is a feast for the eyes. Even though we went to Longwood years ago, our recent trip was our first trip there as a family with both the kids. When we pulled up to the entrance and saw some of the lit trees, my kids were already excited. I knew that if they were that excited about the entrance, they were going to be completely mesmerized once we got inside - and they were! We started our visit by walking around outside. The kids loved the outdoor Garden Railway, and then we moved onto the Conservatory. They really were in awe when they saw the towering trees, lights and ornaments hanging from the ceiling. Just as the kids were getting worn out, we wandered into the Children's Garden and they were instantly filled with energy again. It was like a switch flipped, and suddenly they were ready to go! It was almost impossible to keep up with them in there. They quickly went from one area to another, exploring every little corner. Even adults, without kids, were wandering this garden with curious smiles on their faces. At the dragon's mouth, there were paint-brushes to paint the walls with water, which my kids loved! There was a little spiral staircase, a wall of water, a flower maze, water fountains and other details to get lost in. This was definitely a highlight of our visit. 1) Plan your visit. Times tickets are required during the busy holiday season. Timed tickets sell out quickly, so purchase early online to avoid disappointment. 2) Time your visit to avoid the rush! Arrive by 2pm and avoid the evening rush. If you're a member, you can enjoy Member nights on Mondays which are much less busy. If you're not a member, try to go Tuesday, Wednesday or Thursday when crowds are typically much smaller than on peak days. 3) Bring your stroller. My kids are 4 & 6, so we don't generally use a stroller anymore, however, we did enjoy having our sit n'stand stoller with us during our evening at Longwood Gardens. My kids had already had a long day at school and I knew we were going to be doing a lot of walking, so it was nice to give the kids the option of resting as we were trekking around the grounds. 4) Bundle Up. It was really cold the night we went, so I was happy that we brough our hats, gloves and warm winter coats. 5) Enjoy lunch or dinner there. They have lots of indoor seating, a nice variety of food, and I think their food is fabulous! 6) Support the local merchants in downtown Kennet Square, PA. There's a great mix of unique shops, a winery and some fantastic restaurants, such as La Verona. If you have any questions about Longwood Gardens with kids, leave me a comment or visit the Longwood Garden website. *Please see my full disclosure here.